Why Prodigen Created This Car Pet Carrier Product ? We know how much fun it is to take your pet along for the ride, but we also know the dangers of not having your pet securely anchored in. We know maybe you've got a pet booster seat, but we also know that he is not comfortable in a flimsy car seat. Made for small and medium sized dogs, our booster seat will keep you and your pet safe and ensure car rides remain a fun adventure for all. Give small dogs their own secure car lookout seat. Prodigen booster seat for dogs gives your pup his own comfortable car seat where he can see out the window and enjoy the ride. - The suitable height make your dog look out of the window and won't out when you Brake. - Durable environmental PVC Mesh surface make your dog cool and breathable in the summer. No chemical smells. - High quality antirust buckle and belt ensure Long service life. - Front storage pocket can Stored water ,food and toys. - Inner adjustable lead keep your pet move in safety range. - Installs quickly and easily in almost any vehicle. - Quick removal, folds away compact for storage. IDEAL SIZE FOR YOUR PUPPY - The dog car seat dimensions are 16"L x 12.6"W x 9.5"H and easily holds small and medium dogs up to 20 lbs. The small dog booster seat is so comfortable for your pets such as Yorkies, Teddys, Chihuahuas or cat and safely suitable for most cars, SUVs, and other vehicles. EXCELLENT STRUCTURE DESIGN - Stainless steel rod structure on the top all around side combined with sturdy solid bottom to support the pet booster seat shape and No Collapse. Inner rod will protect your pet car seat from dogs bite. Besides, we designed 2 suspension systems with 2 pair hooks on front and sides. It will be more safe and you can adjust the height let your dog see out of the window of the car as you need. PREMIUM CLOTH & MESH MATERIAL - Durable 600D oxford cloth + A grade PP cotton + Polyester + Sip-proof PVC net. Different from other flimsy dog car seat , our dog booster seat material is thick, anti-skidding, washable, breathable, strong , waterproof, easy cleaning and support the shape well. The PVC mesh was a premium environmental material which has no any chemical odor. 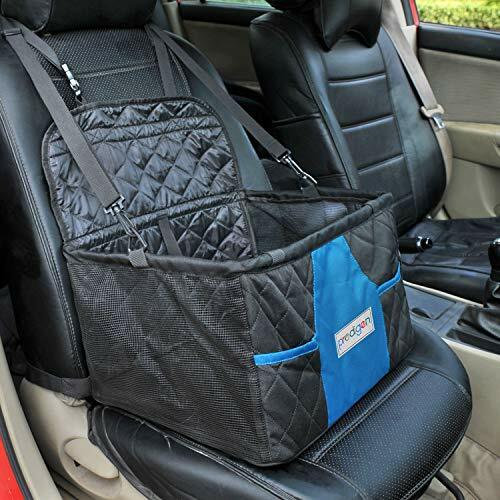 GREAT PET TRAVEL EXPERIENCE - With these dog car seats you can relax knowing your pup is safe and comfortable in his own seat bag when you're driving. And your pet will get a great wide view through the car window in the pet booster seat by 2 mesh sides. Interior safety straps on this dog booster seat clip to your dog's harness keeping them secure in their seat. The pet carrier seat would provide an excellent travel experience. EASY TO ASSEMBLE & STORAGE - The small dog booster seat is easy to assemble and storage because of the foldable design. Just need a few seconds to assemble it on the car seat and folded it up after used. Then, you will find that the dog car seat will save a lot of time and room in a journey. View More In Booster Seats. If you have any questions about this product by Prodigen, contact us by completing and submitting the form below. If you are looking for a specif part number, please include it with your message.